Years of hard work have increased the number of young people diagnosed with diabetes in Rwanda. 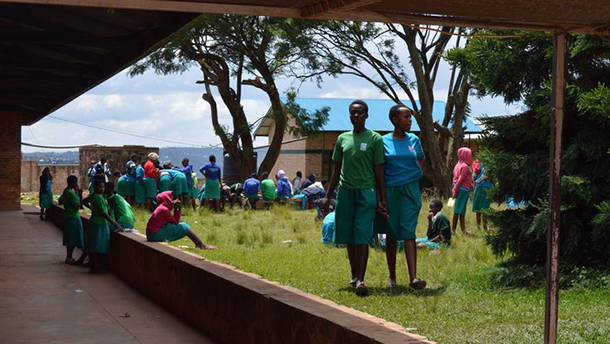 WDF is partnering with the Rwanda Diabetes Association to help them thrive. Crispin Gishoma and Esperance Habinshuti (centre) discuss the 2017 fundraiser project with WDF visitors. Esperance Habinshuti is a 26-year old Kigali resident with big brown eyes and a slow, knowing smile. She also has type 1 diabetes, and spends much of her free time teaching others about the disease and how to manage it. “When Esperence talks, people say, ‘When you speak about your disease, it almost sounds like fun,” says Crispin Gishoma, executive director of the Rwanda Diabetes Association (RDA). Ms Habinshuti sends him an ironic smile. Having type 1 diabetes in Rwanda is definitely not fun, and they both know it. Managing the disease is a non-stop challenge, and the irregular insulin supplies, lack of understanding and stigma don’t help. But Mr Gishoma and his colleagues at RDA are working to change this, and dedicated young people like Ms Habinshuti are part of the plan. The World Diabetes Foundation has been supporting the RDA since 2005. The first and second partnership projects provided badly needed diabetes training for healthcare professionals. This led to a dramatic increase in the number of young people diagnosed with type 1 diabetes – from 3 in 2003 to more than 1500 today. Before 2003, most children and young people suffering from type 1 were most likely to die within a year. In 2017, the RDA and WDF launched a fundraiser project, Rwanda diabetes awareness and support, to provide additional help to this fast-growing and vulnerable group. 1. Improve services – The project would allow the RDA to buy Hba1c machines and reagents, improving the quality of the care they provide in their Kigali clinic and in the district hospitals clinics they support. 2. Run camps – The project would provide funds for two diabetes camps reaching up to 200 young people and their parents. RDA has found camps to be life-changing experiences for young people with type 1, teaching them how to manage the condition, creating lasting friendships, and showing they aren’t alone. 3. 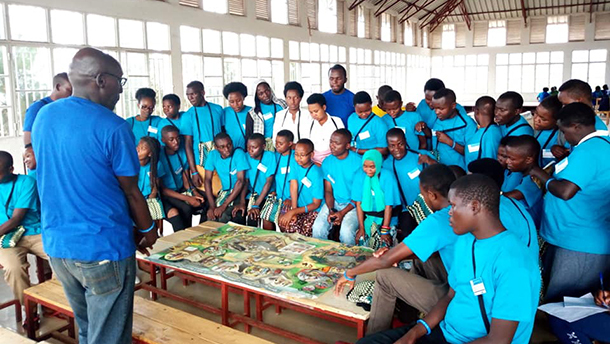 Increase awareness and prevention – The project’s final element was an innovative collaboration with Rwanda’s Girl Guides and youth volunteers to teach students about diabetes prevention and care. These students, in turn, would fan out across the country to raise diabetes awareness among classmates, family and the wider community. From 5-11 August 2018, the RDA held the first of two Diabetes Youth Camps funded by the World Diabetes Foundation. A total of 77 young people attended the camp, each accompanied by one parent (parental support contributes significantly to the health and happiness of youth with type 1, RDA staff say). A lesson using a diabetes conversation map at diabetes camp in 2018. Ms Habinshuti was one of 20 volunteers who lived with the campers and assisted them throughout the week. “I wish I had the chance to be a camper when I was diagnosed. I would have learned so much. But I’m happy to work with these young type 1 diabetics, and to inspire them,” she says. Ms Habinshuti is part of the awareness and prevention project as well. RDA invited her to form a ‘trio’ with a youth leader and a Girl Guide, which would then receive training in diabetes prevention and care. Her trio – and 13 others like it across the country – are now in the process of visiting selected schools and youth clubs, where they teach other youth about diabetes. Students at the Groupe Scolaire Notre Dame Du Bon Conseil, one of 70 schools participating in the awareness and prevention project. After being trained by the trios, school health club members are encouraged to conduct awareness campaigns in their schools and communities. Many have done so, with creativity and enthusiasm, Mr Gishoma says. For example, students have held awareness activities for parents, organised campaigns in public places, met with local authorities, organised community work-outs, and even gone door to door to talk about diabetes. While the awareness raising will continue until 2020, it is already making an impact. At least one district hospital has reported a surge in requests for diabetes screening. Several schools have increased the time allotted to physical activities. One teacher recognised the symptoms he had been experiencing and went to a local health centre, where he was diagnosed with type 2 diabetes, the RDA reports. The confidence that the young people gain from the experience is an added benefit, Mr Gishoma says. Asked who makes the decisions in her trio, Ms Habinshuti answers in Kinyarwanda. Mr Gishoma grins, and translates: “Normally, the youth leader is in charge. But Esperance’s trio is an exception – in her trio, she’s the leader,” he says.